Evolutionary theory can help answer questions about issues ranging from the behavior of a virus to international relations and religion. So says Wilson (Biology and Anthropology/Binghamton Univ. ), who writes with the glee of a guy who’s discovered the philosopher’s stone. Evolutionary theory is not all that difficult, he argues fervently. Furthermore, it’s applicable to the study of all human behavior and all human societies. At times, the author’s enthusiasm is infectious, especially when he focuses on his own research questions and describes the processes he employed to answer them (for example, the studies of world religions that culminated in Darwin’s Cathedral, 2002). He generously summarizes and lavishly praises the work of likeminded colleagues—e.g., Thomas Seeley’s extensive research on honeybees—and the efforts of his students, who frequently participate in the author’s research. He repeatedly tips his mortarboard to the John Templeton Foundation, which has funded a number of his activities. The book’s very personal, scholar-adventurer tone makes some of this read like memoir, especially the penultimate chapter, relating Wilson’s boyhood (father Sloan wrote The Man in the Gray Flannel Suit), education, marriage, divorce and remarriage (current wife and colleague Anne is profiled with great affection). 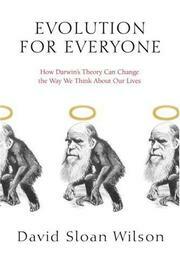 The author outlines basic Darwinian principles, then proceeds through a series of chapters that illustrate how they apply to such matters as homicide, human personality, physical attractiveness, morality, human societies, laughter, literature and the arts, symbolic thinking, religion and international relations. He takes some shots at creationists but in far less confrontational, dismissive fashion than either Richard Dawkins or Sam Harris. A clear, concise description of how evolutionary theory works, ardently argued by a True Believer.